I have gotten so many questions on this topic over the past couple of months, and I totally get why! I too am always curious about what other people take in terms of their supplements. And even though it's totally a personal thing that will vary for everyone, I'm always interested to know what others are taking- and most importantly, why! So after avoiding the topic for awhile (for good reason), I'm here to share with you all! And why I've been avoiding it? Because like I said, it's personal. 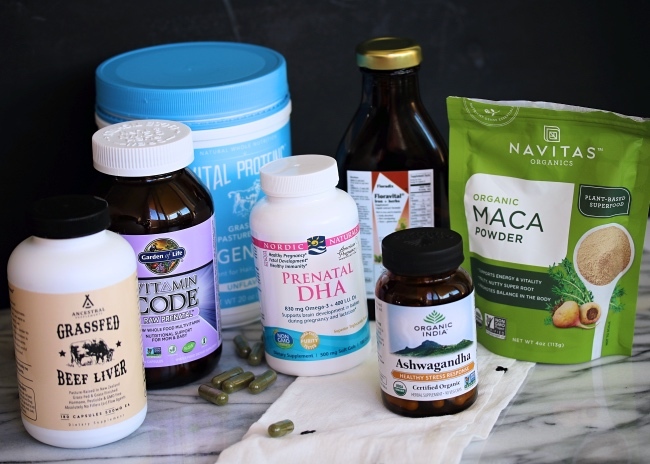 Each of the supplements I choose to take (and spend my hard earned $ on) is specific to me and where I'm at now, as well as what my goals are moving forward. So I wanted to make sure & take the time to explain each one and it's "why" before blindly recommending them to you. Of course each day I work to get in as many nutrients as I can from the best source there is: whole, healthy foods! But there are some things that I find are easiest & most effective when supplemented, and I choose to add them to my daily routine on top of the foods I'm eating. Now let's start with where I'm at now & where I'm looking to go- so you can get an idea of my "why" and see if any of these things might work for you! P.S. *disclaimer*: This is not me recommending anything, just sharing what has worked for me that I have chosen to take based on my own research! engaged to be married REAL soon, and hoping hard to try for babies in the very near future! Now most of this is achieved through my diet, exercise, and general lifestyle habits, but I do rely on my supplements to help me work towards my goals each day! And on the pregnancy thing: so personal. I went back & forth on sharing the fact that I'm wanting to try soon, because in the back of my mind I always worry that there could be a problem with getting pregnant- and it won't happen. And then it would all be "out there" for people to know. But I know that I'm doing all that's in my power to prepare my body, and hoping for the best, while taking the best care of myself that I can! That's all I can do, and I'm ready to share it all with you guys because I know I can't be the only one at this stage in life! So I hope this helps you. I feel like when it comes to supplements, having a list of "goals" is so important. It will drive your "why" and keep you from taking random things that you don't truly need (and ending up with a cabinet full of things you won't take). It will also keep you motivated to actually take them! Knowing my "why" keeps me on track with taking them every night- even when I'm tired and really just want to jump right into my bed. I also wanted to note that while I am taking all of these things now, I am fluid with my supplements and will change things up as needed. 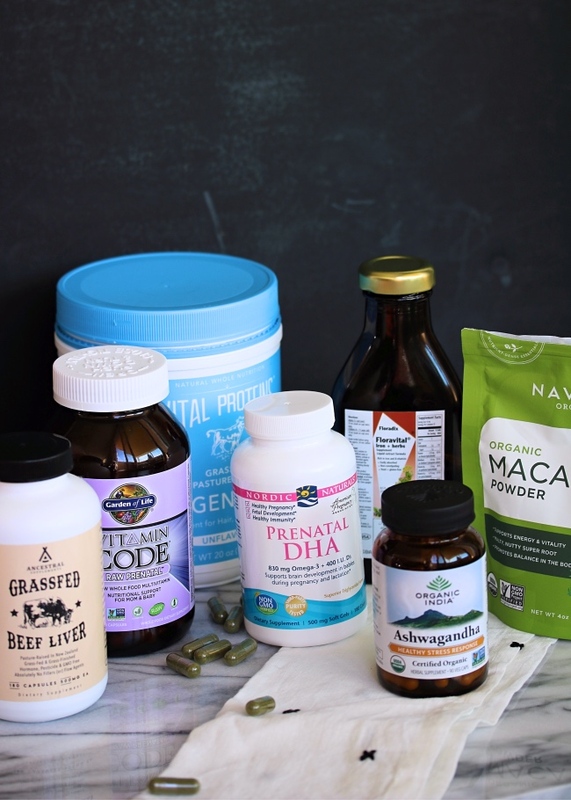 For this post, I put a (*) next to any supplement I will not be taking once I'm trying for pregnancy, due to conflicting research on consumption for expectant mothers. What I Take... and Why! Floradix Iron & Herbs: I take this for the iron, and can tell an immediate difference if I miss it! It keeps the headaches away and helps with my energy levels. The ingredients are also SO good compared to other iron supplements I've tried- and the taste is so much better! Nordic Naturals Prenatal DHA: Fish oil is another must for me due to the omega-3 fatty acids and the anti-inflammatory properties. Reducing inflammation has been a huge help for my skin (acne) and for inflammatory knee pain, and is also one way I help prevent heart disease and boost my immune system. I love that this one is pregnancy safe, with added D3 to support strong bones & brain development. Vital Proteins Collagen: I incorporate collagen into my routine daily, but switch back & forth between specific products. 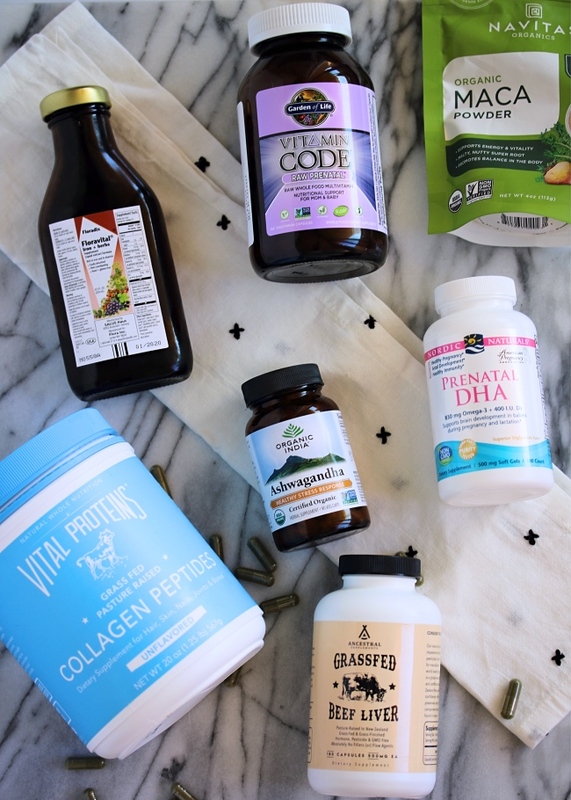 My biggest reasons for adding collagen to my diet: the hair, skin, & nails benefits, the digestive support (this has been big for me), and easing joint pain (this has really helped my knee along with strengthening those muscles through exercise!) The Collagen Peptides (blue canister) are flavorless and dissolve into almost anything, so they're very versatile. The Vanilla Collagen Peptides have an added probiotic & hyaluronic acid- so I love the nutrition profile of this one! It's great for coffee, tea, smoothies, and baked goods. The Vanilla Collagen Creamer is similar to the peptides, but with less collagen and more focus on the "creamer" aspect to add a thicker texture to your coffee. I use a small amount of this and treat it more like a coffee creamer (with a boost of healthy fats & collagen) than an actual supplement. Spirulina Capsules: If there's a day where I don't feel like I've gotten in enough greens or micronutrients, I love adding some sort of greens powder or capsule to my routine. Spirulina is a blue-green algae that provides tons of antioxidants and helps detoxify my system. *Organic India Ashwagandha: This is something I take to support a healthy stress response and to help with deeper sleep and fighting adrenal fatigue. It helps with my energy levels and metabolism. However: I will be stopping this herbal supplement once we are trying for a baby. There is conflicting research out there regarding its impact on the uterus and some say it can cause miscarriage. I suggest looking into it yourself or asking your doctor, but I personally will put this on hold during that time in my life. *Navitas Naturals Organic Maca Powder: This is something that I only consume on occasion, and use for a natural energy boost and support with stress hormones. I occasionally add it to my coffee or to smoothies. It also adds a bit of a caramel flavor which I love. If any of these sound like something you can benefit from, I'd suggest doing your own research & talking to your doctor! And like I said, I'm nosy: so I want to know what you take too! Let me know in the comments below if you take any of these, or if there's something else you swear by! I recently started following you within the last few months and found this so helpful. I recently started using incorporating collagen and a multivitamin into my routine. It is so helpful to hear about the other things you take too. Thank you for being so open and personal and also sharing what you’re taking based on when you start trying to get pregnant as well! Jessie, thank you for sharing this! I have recently begun to incorporate supplements in addition to paleo/clean eating to take healthy living up a notch. It hasn't been easy to find trustworthy reviews/routines - especially for hopeful future mamas! Thanks again. Do you also incorporate probiotics? Any recommendations for the most effective product? Thanks for the awesome post Jessie!